It's never too early to teach your kids (or any kids) how to value resources, not to waste anything (from time to water), and to respect the planet. 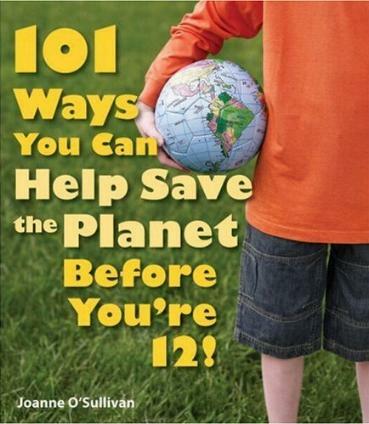 This ingenious little book will help you find things to interest your children, and if the children get interested, theres hope for the planet. Adults can learn from this book as well—there's always something new to learn. Start in the home with no more new plastic water bottles (unless you're using the same one over and over until it falls apart—one way of saving if you must use a plastic bottle); pick up after your dog—poop gets washed into the waterways by rain! Yuck! Eat healthily and eat as close to organic, if not completely organic, as possible. Learn to read food labels and don't be fooled by clever, gimicky marketing words and terms! Don't waste food, ever. [Teach kids not to take too much to begin with, but rather to come back for a little more if they're not satisfied.] Recycle and don't waste paper. Wasted paper equals tree loss, and we need trees as they help clean up the air we breathe. Recharge batteries; it's efficient and economical and it just makes sense. Teach kids the value of helping others. Take your kids to a landfill and let them see firsthand where their junk goes. It doesn't "go" anywhere—it stays put forever and ever and ever. There are many more very worthwhile ideas that we all, adults and children, should be exploring and implementing into our daily lives. I wish there was a universal anti-idling law. It's criminal pumping so much poison into the air just to keep cool or warm while you're standing still in the car for a while. As a bicyclist, I come across this all the time, and I'm tired of choking because of selfish drivers. Teach kids not to let the taps run unnecessarily or to waste water at all—if we run out of clean water, we're doomed. There is no excuse for kids to be bored, or to sit and play video games all day. They can make a difference if you show them. Conclusion - A brilliant little book that should be in every family's home!